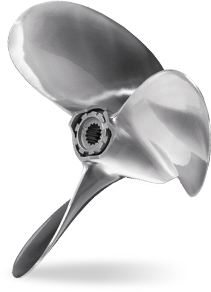 A new casting technique makes the Chopper II propeller more durable than ever. 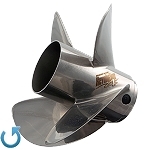 The new Chopper II, an improved version of the original Chopper propeller, works well on heavier boats that need bow lift. 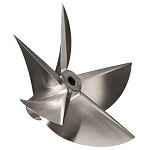 The enhanced bow lift reduces drag, increasing the efficiency of the boat and improving overall performance. 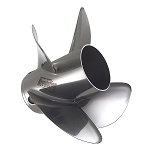 The Chopper II permits higher engine mounting on the transom for greater speed. Designed to run 50+ MPH. Equipped with a rubber hub in 20-25hp. Q: Will this go straight onto a stock 2017 Mercury 20 hp 4 stroke short shaft? Or do modifications have to be made to the hub? 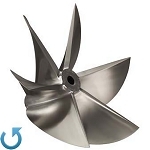 A chopper II can except a prop shaft diameter of .696, 10 spline, this would be a two stroke. The hub needs to be modified to fit a 20/30 HP four stroke. I called Mercury propellers and they indicated that the 20 - 25 four stroke's have the 14 spline prop and a smaller prop shaft, .600 diameter. The Vengence is not a performance prop like the chcpper.